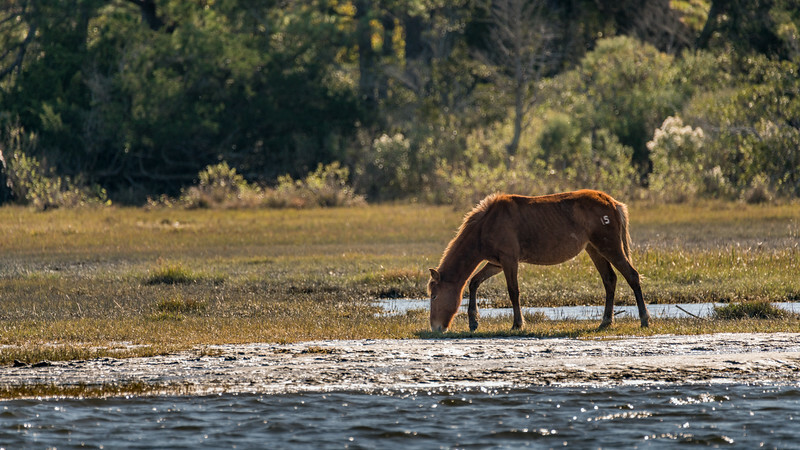 Chincoteague National Wildlife Refuge offers beaches, warm oceans, ponies, waterbirds and maritime forest. So beautiful. 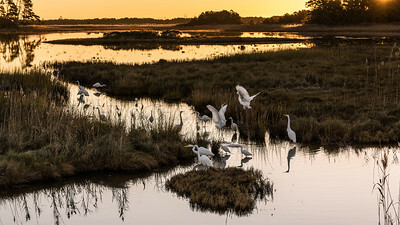 A Mid November morning in Chincoteague brought a group of Great Egrets, Snowy Egrets and juvenile White Ibis to a little neck of water. For some reason they were all there this morning. Next morning they were further out. 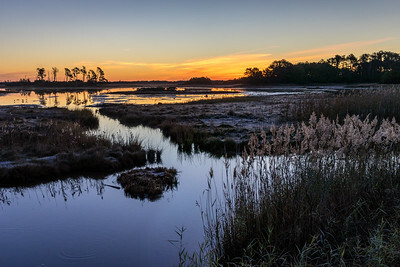 Mid November brought morning frosts, which can be seen lying on the on the little islands in the pond. 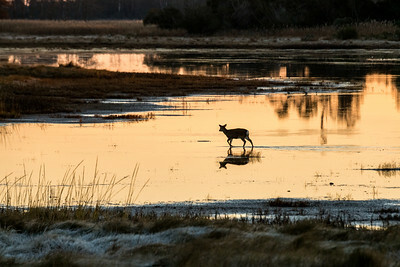 The tiny and beautiful Sika deer cross the pond in Chincoteague at dawn. Frost lies on the little islands. These beautiful deer were originally from Japan. My friend told me boy scouts brought them to Chincoteague in the 1920's. 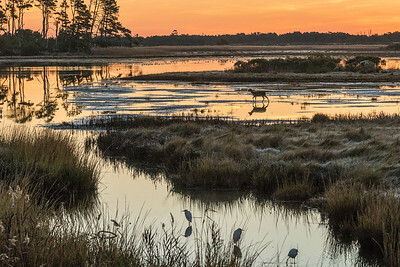 A small herd of these delicate little deer were visible at dawn, crossing the pond. We saw one stag and several does. They seemed to be visible only as silhouettes against a rising sun and pink water. 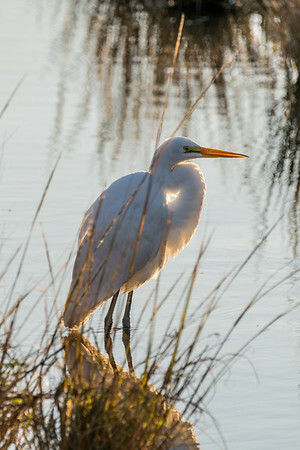 Morning brought Great Egrets, Snowy Egrets and juvenile Ibis to a tiny channel in the pond. This morning there was a lot of interactions between the individuals. 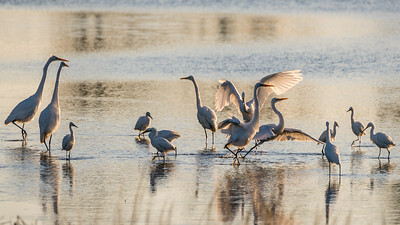 Morning feeding time for the Great Egrets and their fellows. The birds were out in the pond. This was my first try at fluttering birds. 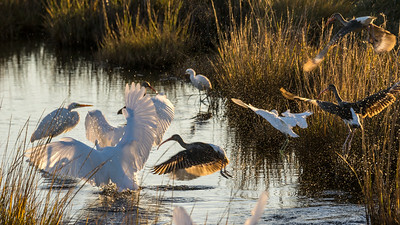 I wish I understood the behavior, but love the majestic white birds in silhouette. 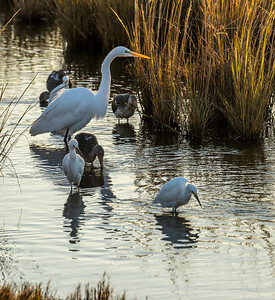 Great Egret posing at pond's edge in Chincoteague. 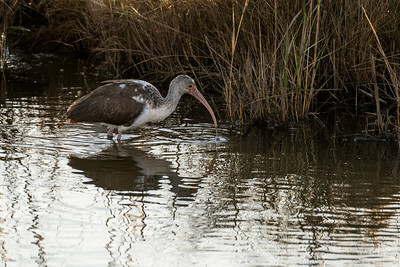 Early morning in Chincoteague Great and Snowy Egrets with juvenile Ibis fly up while feeding, . I know this is out of focus, hopefully I will, some day soon, present one in focus. In the mean timer I cannnot resist the light on the birds and water droplets. 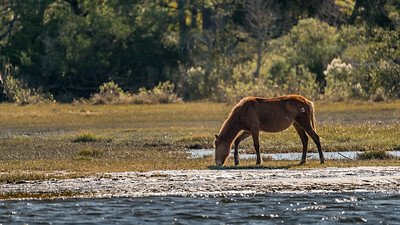 Early morning view of Chincoteague Ponies grazing. This scene made me think of the English painters who were commissioned to paint the estates and animals of the very wealthy in the 19th Century. 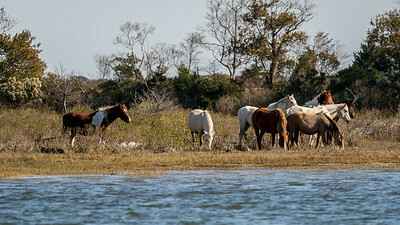 Taking a boat around the island heading north brought us to views of the feral Chincoteague ponies. Once a year "saltwater cowboys"-the local firemen, herd the ponies across the channel where the pack is culled. In this case that means selling ponies to people who will love them. 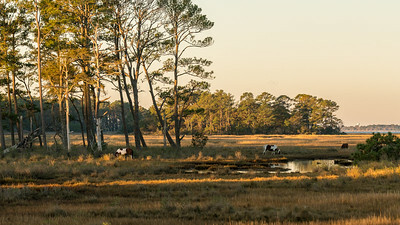 The island herd is kept to 150 individuals. The proceeds of the sale go into maintaining the herd. The brown and white pony on the left seemed to lead the other horses. They have largish tummies from eating salty sea grass, the salt retaining the water. Once the females have babies the tummy stays as it is. We had the pleasure of being allowed on the compound of a resident family. 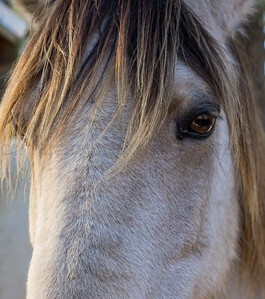 They had several ponies wandering around at will. I was advised to bring a few apples. The ponies ate them quickly and then approached the camera as if it had more! Just before the sun went down the air turned blue and magenta. 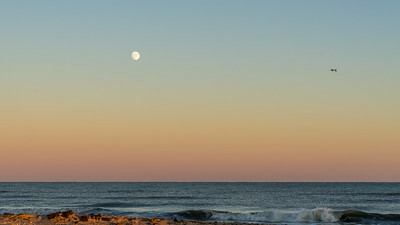 The large moon was close and visible in daylight. The next day was the moon was closer to the earth than it would be in another 30 years. 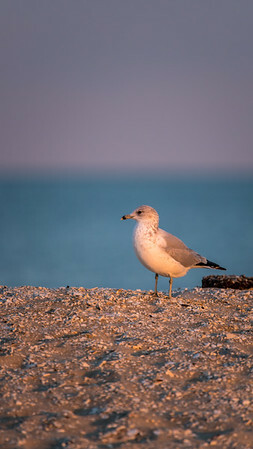 Immatuure Herring Gull perched a top a man made dune on the beach at Chincoteatgue, just before sunset. The light turned the purple-magenta just visible on the gulls neck and grey back. 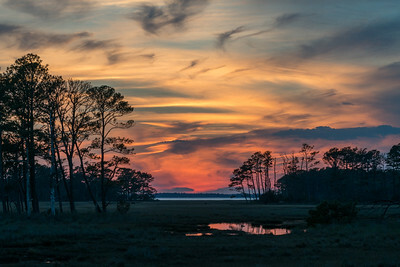 This sunset might look like a painters' interpretation, but in fact it looked like this. The South East is enduring drought conditions, we had no clouds or rain, yet this evening this sunset favored us for a few minutes.